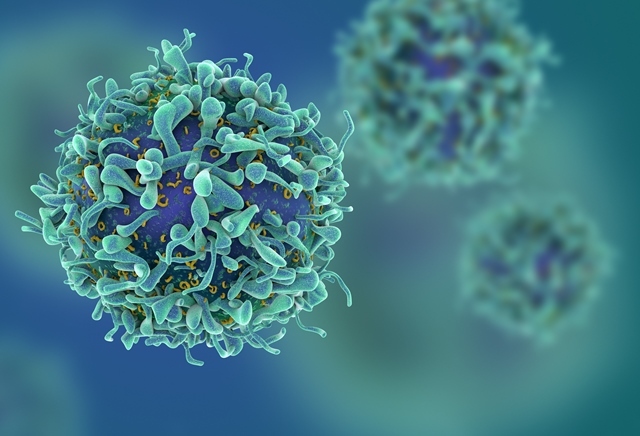 A new study shows that PARP inhibitors have a previously unknown ability to boost the immune system, meaning it could help more patients benefit from immunotherapy. The study changes our understanding of how PARP inhibitors work and suggests they could be used alongside immunotherapies to boost their effectiveness. Clinical trials have already started to assess this combination. Some patients have benefited dramatically from a new generation of immunotherapies – but often only between 10 and 20% of patients will respond, with many others’ cancers able to hide from the immune system. PARP inhibitors – such as olaparib – block one of the systems which cells use to repair their DNA. They are designed to attack tumours that are already defective at DNA repair, especially ovarian and breast cancers in women with inherited BRCA mutations. The researchers looked at lung tumours taken from patients and found those with deficiencies in their DNA repair contained significantly more immune cells within the tumours, compared with tumours in patients with a functioning DNA repair system. This suggested that the DNA repair mutations were stimulating an immune response against the tumours. The scientists found that PARP inhibitors could potentially be used to treat lung cancers with faults in their DNA repair genes, in part because of these newly discovered effects on the immune system. By using PARP inhibitors alongside immunotherapy, this immune response could be further enhanced to kill the cancer cells more effectively. As 30 to 50% of patients with non-small cell lung cancer have a deficiency in the ERCC1 DNA repair system, this could open up a new, more effective ways of treating a large proportion of non-small cell lung cancer patients. Study leader Professor Chris Lord, Professor of Cancer Genomics at The Institute of Cancer Research, London, said: “The findings of this study substantially change our understanding of how PARP inhibitors work. “We now know that they not only kill tumours by damaging their DNA, but also by attracting immune cells to attack them – acting as a sort of double-pronged attack. “Immunotherapy is a genuinely brilliant cancer treatment but generally only for the 10 to 20 per cent of people who respond to it. Study co-leader Dr Sophie Postel-Vinay, Clinician Scientist and Medical Oncologist at Gustave Roussy, France, and The Institute of Cancer Research, London, said: “Our study found that PARP inhibitors enlist immune cells to aid in the killing of cancer cells. The study is published in the Journal of Clinical Investigation and was funded by Breast Cancer Now and Cancer Research UK, with additional support from Siric Socrates, the Philanthropia Foundation and the Inserm ATIP-Avenir programme.